Last week I wrote that we were snoozing our way to the polls. I think it at least warrants a follow up. Make no mistake about it, we did snooze through this election. Voter turn out was only 61%. That number was only slightly higher than the pathetic 58.8% that turned out in 2008. Voter turnout has been generally falling every election since 1979. The 1958 election that brought John Diefenbaker to power had the nation’s highest-ever turnout, at 79.4 per cent. Nevertheless Tuesday morning we arose to a rude awakening. The results of the federal election was startling to say the least. Not so much because Steven Harper finally got his much coveted majority government. (Although that was a significant feat considering he managed to run a 35 day campaign without saying almost anything. My feeling is that Canadians have election fatigue and by granting Harper a majority they ensure that we will not be back to the polls till 2015. New legislation requires set election dates every four years. But because of minority parliaments we have never made it that long.) No, the big surprise last week was the meltdown of the Liberals and the Bloc and the rise of the NPD to the official opposition. I don’t think anyone expected both Gilles Duceppe and Michael Ignatieff to lose their seats. It was the ultimate rebuke. It doesn’t hurt my feelings, as I am not sure I will miss Duceppe’s tiring separatism or Ignatieff”s thinly veiled personal ambitions. With the Bloc being decimated to 4 seats and the Liberals being reduced to the rump with only 34 seats it is a new political era in Canada. As it turns out this may be the most significant election since 1993 when the the Tories were reduced to 2 seats and the Reform Party broke through to eventually become the official opposition. 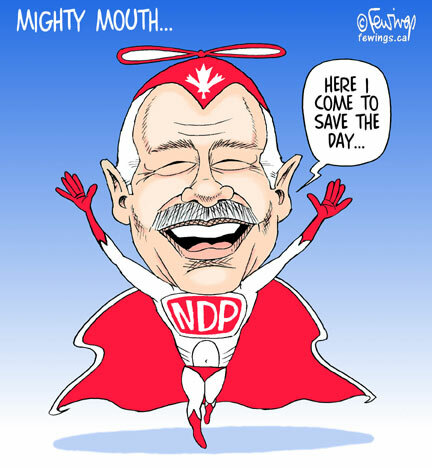 Today the shoe is only the other foot with the NDP breaking out with 102 seats and Jack Layton heading to Stornoway. It should be interesting. Half of their seats are in Quebec where Quebecers blindly voted for people they know nothing about. NDP rookie Pierre-Luc Dusseault is the youngest MP in history and at 19 years old is barely out of High School. Another Quebec rookie MP, Ruth Ellen Brosseau, has never set foot in her riding, does not speak French, did not put up a single campaign sign and spent part of the election campaign vacationing in Las Vegas. She was just a name on the ballot and is now heading to Ottawa. Shadow cabinet material for sure! Jumping Jack will have his hands full keeping that bunch in check.